There are currently more than 20 million U.S. veterans, over 1.2 million men and women serving on active duty in our Armed Forces and another 800,000 in the reserves. Many millions more have served in uniform since the birth of our nation, in peacetime and war. Behind every one of them is a story – of struggle, perseverance, camaraderie, triumph, and sometimes even tragedy. At the USPTO, we are committed to working with veterans who are transitioning or have recently transitioned from active duty. One way we do this is through our highly successful Veteran Hiring Program. In fiscal year 2018, 8% of new patent examiner hires and 17% of all other new hires were veterans or transitioning service members. Since the program began in 2012, we’ve hired approximately 800 veterans or transitioning service members. Once at the USPTO, we continue to provide a support network through the USPTO Military Association, an affinity group comprised of veterans, spouses of veterans, and employees who support our veterans and those still serving in the reserves. Clockwise from top left: Keepsakes from USPTO employees Mary Capodice, Troy Tyler, Dean Dominique, and Cevilla Randle. Photos by Jay Premack/USPTO. 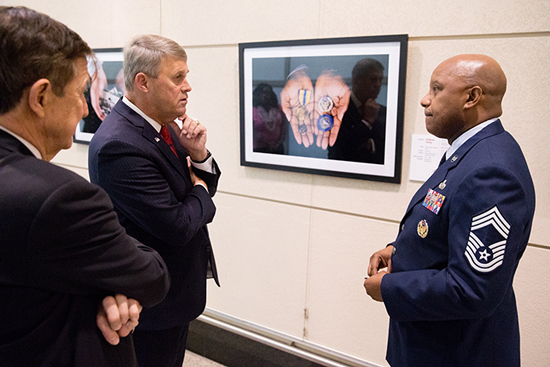 At the end of October, we unveiled our Veterans Keepsake Project, a photography exhibit highlighting stories and keepsakes of military service from USPTO employees and their loved ones. The intention of this effort was to take something so large and important like the millions of veterans who have served and are serving our nation, and find the individual stories within. The end results are personal and emotional accounts from USPTO employees that foster a reverence for service and sacrifice. On November 8, Lieutenant General David Halverson, U.S. Army, Ret., gave remarks at the USPTO’s annual Veterans Day ceremony. Before the event began, we toured the exhibit, and in the process we met many of the subjects in the photographs. Lieutenant General Halverson remarked on the power of stories and shared one of his own. Lt. Gen. David Halverson speaks to USPTO employee Anthony Twitty about his keepsakes. Photo by Jay Premack/USPTO. I encourage everyone to stop by and view the Veterans Keepsake Project through December 3, located on the concourse level of the Madison building on the east side of the auditorium at our headquarters in Alexandria. 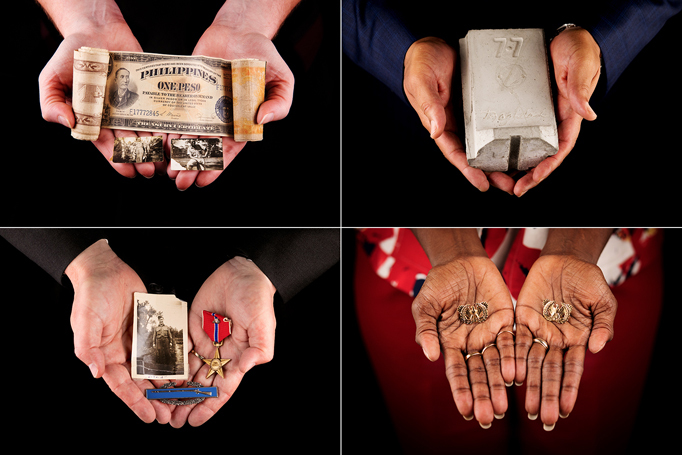 If you are unable to come in person, you can also view the photographs on the Veterans Keepsake Project page of the USPTO website. Also featured at the USPTO is the Visionary Veterans® exhibit at the National Inventors Hall of Fame Museum, which commemorates the 100th anniversary of the United States entering World War I, focusing on stories of five WWI veterans responsible for innovations that continue to benefit our world. Veteran Donald W. Banner was the U.S. Commissioner of Patents and Trademarks during 1978 and 1979. As a Second Lieutenant in WWII he served as a P-47 fighter pilot and was shot down by Nazi Germany on his 39th mission in late 1944. He was captured and became a prisoner of war interned at a prison camp in Mooseburg, Germany until liberated by General Patton’s 3rd Army on April 29, 1945. He is buried is Section 69, grave 710 in Arlington National Cemetery. Thank you for attempting to serve our vets after they have served us.